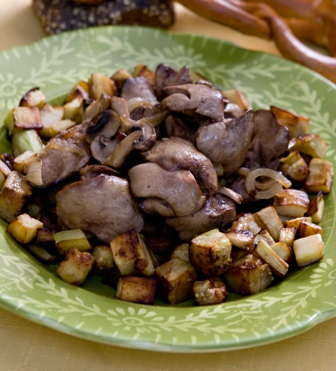 Fried chicken lungs with stewed mushrooms, onion and eggplant. Washed and chopped mushrooms are fried in a deep pan with sliced onions and salt to taste. Add chicken lungs after 10 minutes, also add 2/3 cup of water and stew it for 20 more minutes. Fry the eggplant in a different pan and out it to the lung. Add also the paprika, pepper, savory and finely chopped parsley. Do NOT mix lungs with liver. That recipe is for chicken liver!! !